A member of the General Strike Committee and columnist for the Union Record, Strong gained notoriety when on the eve of the 1919 strike she penned a front-page editorial, that seemed to call for revolution, entitled No One Knows Where. Photo courtesy Seattle Public Library and History.link.org. Anna Louise Strong begins her autobiography I Change Worlds, with a story about herself as a little girl wandering through a garden and realizing, for the first time in her short life, the powerful sensation of loneliness. For the grown woman writing her memoirs in 1935 this epiphany symbolized Anna Louise's steadfast, life-long dedication to a Socialist ideal that united all human beings in peace. Anna Louise's' journey to becoming an influential labor journalist did indeed begin in her early childhood, but it would take moving to the Pacific Northwest and demonstrating her talents in the pages of the Seattle Union Record to truly steer her toward the radical journalism that would eventually become her trademark to the world. The various literary styles that Anna Louise utilized during her years employed at the Seattle Union Record exemplify both her unique perspective on the politics of class and gender and her rather paradoxical role in the Seattle labor movement during the era of the General Strike of 1919. Through her ragged verse poetry using the pseudonym Anise, Anna Louise revealed her powerful abilities as a propagandist of socialist thought and union empowerment. While Anise appealed to the male-dominant union workers, Anna Louise addressed the issues concerning the role of women in the labor movement in the Ruth Ridgway advice column. Through Ruth Ridgway, Anna Louise provided the forum for discussing the complex debate amongst middle class Socialist women, the feminist working class, and union men regarding the status of women in labor and society itself. Most of her writing, regardless of the pseudonym, however, discussed women in the realm of the domestic sphere. Thus, while Anna Louises journalism reveals her to be a unique, authoritarian, female voice in a male-dominant labor movement, her writing also shows her to be a paradoxical, ambivalent character, torn between a progressive ideal and her traditional roots. The fascinating journey of Anna Louise began in Friend, Nebraska on November 14, 1885, when she was born two weeks early to first-time parents Sydney and Ruth Strong. Anna Louises parents had met at Oberlin College, where Sydney pursued his studies in Congregationalist ministry. Ruth found in herself a dedicated activist in the struggle for equality on behalf of women and African-Americans. It is clear that Anna Louises writing was heavily influenced by both of her parents; the themes of Christianity and social justice are essential elements of her early writing, and they exemplify motifs that she carried with her, and displayed in her writing, throughout her life. Her parents encouraged the writing talents of Anna Louise by providing her with a sound education both at a public school and at home. According to Anna Louise, her mother destined her to be a writer from early childhood. Ruth Strong also encouraged her children to be independent—a modern progressive mother, Anna Louise called her. Eventually Anna Louise would attend college at Oberlin herself, after completing her first year of study at Bryn Mawr. She earned her B.A. in 1905 and went on to graduate study at the University of Chicago. Graduating with honors, Anna Louise completed a dissertation entitled A Consideration of Prayer from the Standpoint of Social Psychology at the University of Chicago in 1908, at the age of 23. While writing her Ph.D. thesis, Anna Louise officially began her career in journalism at a Chicago newspaper called the Advance. Hired as an associate editor, Anna Louise wrote under four different pseudonyms, using a certain name with a specific topic. In her autobiography she explains being drawn to the idea of using pen-names, stating: I knew that the purpose of this was to bluff our readers into thinking that we had a big, expensive staff, but this already seemed to me clever. Anna Louise would continue the practice of writing under pseudonyms many more times throughout her journalistic career. Anna Louises' time in Chicago working at the Advance would prove to be short-lived, however. Always restless to travel to new sites of progressive action, Anna Louise spent the next few years working on various campaigns and projects that would introduce her to socialist ideology. Along with her father, who had since relocated to Seattle after Ruth Strong died, Anna Louise organized a campaign called Know Your City, a project devoted to promoting Christian social ideals in various northwestern cities. Anna Louise would later travel to the east coast to participate in the National Child Labor Committee, a progressive project aimed at improving the lives of urban children. As a member of the committee, Anna Louise contributed to lobbying, exhibits, and education through research. Thus I came to condemn capitalism, not through any oppression endured by me personally, but through the very definition of efficiency which capitalism taught me, for its own purposes. By 1915, Anna Louise was growing restless with her work at the Children's Bureau. She was content to settle in Seattle for several reasons. With the winding down of her efforts with the Children's Bureau, and the failure of more than one romantic relationship, Anna Louise's life had struck an impasse. Moreover, Anna Louise, an avid mountaineer, was also clearly drawn to the wilderness of the Pacific Northwest. The most significant reason for moving to Seattle at that time, of course, was to care for her father. Despite the fact that her brother Tracy lived in a neighboring house, Anna Louise fulfilled her role as the dutiful eldest, not to mention single, daughter by moving into her fathers house. According to Tracy B. Strongs' biography Right in Her Soul, Anna Louise was able to focus her efforts in the public world after obtaining the security of her family around her. Although she wanted to run for the state legislature, Anna Louise's first endeavor in Seattle was to obtain a seat on the Seattle School Board. Supported by pro-labor factions, women's organizations, and a solid reputation from her work in the child labor movement, she promised to bring a woman's point of view to education politics. In 1916, Seattle was clearly a city noted for its progressive politics and strong labor movement, and the excitement of such an atmosphere inspired Anna Louise. 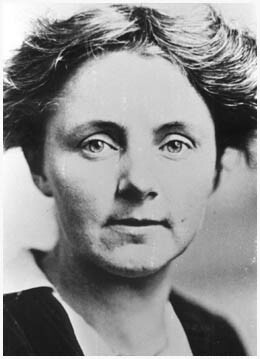 While she did have a strong foundation in socialist beliefs and left-wing ideology, her experiences within and influences of the Seattle labor movement, especially the events leading up to and including the General Strike, would serve to radicalize Anna Louise in her socialist convictions. It was through her writing, however, that Anna Louise earned the label of revolutionary from the Seattle public. Anna Louise made her Seattle journalistic debut at the Seattle Daily Call, a weekly socialist newspaper that did not last long after she began her employment there. The Seattle Daily Call was associated with various left-wing factions, and Anna Louise, who was writing under the pseudonym Gale, was soon becoming known throughout the city for her radical tendencies. After reporting on the Everett trial for the New York's Saturday Evening Post, in which she tended to favor the leftist International Workers of the World, or I.W.W., Anna Louise became associated with the Bolshevik cause. Because of her new, radical reputation, a campaign to recall Anna Louise from the Seattle School Board soon began to take shape. Anna Louise eventually lost her seat on the school board, an especially poignant loss in light of the fact that she was the first woman member in several years. She would not leave the board quietly, however, choosing instead to use the recall campaign to educate the public on the evils of Big Business. Asserting that corporate big-wigs influenced every aspect in Seattle, Anna Louise sought to connect the unchecked power of capitalism with social responsibilities such as the appropriation of education funds. Her files contain letters that bear witness to the public debate that ensued—letters from strangers who offered support for a woman who they felt truly captured the interests of the common Seattleite. Thus, covering the Everett trial and her ensuing recall from the school board seem to provide the impetus that would motivate Anna Louise to a new level of militantism in her writing. After the Seattle Daily Call fell into bankruptcy, Anna Louise was immediately hired by Harry Ault, editor of the Seattle Union Record. In her autobiography, Anna Louise declares that she was offered whatever position she wished within the paper, which had just undergone the change from weekly to daily printing. She became the Union Records feature editor, making her responsible for the editorial and feature (womens ) pages. Aside from the editorials that Ault himself wrote and articles from contributing Socialist authors, Anna Louise apparently wrote, or at the very least edited, everything in the feature section. And Anise is short for Anna Louise Strong, recalled from the School Board, just in time to start work on a really interesting job as feature and magazine editor of the Union Record. The Anise writings were formatted in an informal poetry style described as ragged verse. The format was not her original creation: Anna Louise borrowed the style from various religious and literary works. Furthermore, at the time, this form of writing was being used by the author known as K.C.B. who wrote for the Seattle Times. Mary Joan O'Connell argues that, despite mimicking the style of a writer published in a rival newspaper, Anna Louise was clearly responsible for popularizing the writing form through her near-daily poem. The Anise poem included in almost each days edition of the Union Record was unmistakably designed by its author to attract the eye of the reader, both in content and form. In these big, cool houses! A typical Anise verse was formatted into three columns, each line of which was separated by three asterisks. Anise also used the device of attracting attention to specific words and phrases through capitalization. Inserted approximately every few lines, these emphasized words would highlight the poems labor theme. Anises poetry demonstrates a fairly consistent capitalization of words such as UNION, TOGETHER, LABOR, and RIGHTS to highlight her ragged verse, both visually and literarily. Although she confronted various issues in her Anise poetry, Anna Louise did not usually use the column to discuss the plight of women. Indeed, Anises tone toward women's issues does not appear to be one of exaggerated devotion to the suffrage movement. Anise did not argue that women could add a new sense of morality to politics if only allowed to participate in that realm of society, nor did she assert that women were inherently better creatures than men; she did, however, argue against the actual role in society that women had been designated. Another poem by Anise entitled What Women Shall Do depicts the debate surrounding the issue of whether women workers should be permitted to wear overalls while working in a factory. Despite the controversy over the appropriate apparel for women in the workforce amongst women of the upper classes, Anise describes how this kind of discussion by women is purely arbitrary; men had the real control, and would ultimately make the decisions, in regards to what women would wear. In addition to being a brilliant writer, Anna Louise was a talented propagandist. Her strategic manipulation of her writing could capture the readership that she intended, and this fact speaks powerfully to her views on the politics of gender. Except for a handful of instances, Anna Louise did not specifically discuss women's rights in her ragged verse poetry. Instead, Anise would include stories of women as mothers, or women as workers; but her writing suggests that these women were defined in these roles primarily before being thought of as women. Moreover, the Anise poems demonstrate the perspective that a woman's class status was more inhibiting than her gender. Of course Anna Louise's argument was an honest one, but she placed all of the blame on the bosses for ...stirring up white men to HATE THEM. She omitted any discussions of the rights of African-Americans as human beings. Anna Louise wrote the Anise poems to encourage and advance the labor movement—a movement by and large dominated by white males. In order to maintain the attention of and influence over these male members of the labor force, the ones who really possessed the leadership and authority within the labor movement, Anna Louise wrote specifically for them. To ensure reaching the greatest number of readers, Anna Louise chose not to focus on gender and racial issues; this was especially essential in a movement that clearly practiced systematic discrimination against women and racial minorities. Thus, although the topic of women was surely not censored from her articles, Anise did not pursue the issue of women's role in labor to the point of alienating the male working force. Anna Louise offered the wealthy, aristocratic business men as the enemy, not the humble working class men; it was the owners of production who were making the decision on whether women would wear overalls in the factory or not—not institutionalized sexism. We are undertaking the most tremendous move ever made LABOR in this country, a move which will lead—NO ONE KNOWS WHERE! This article would prove to be the most symbolic writing associated with the Seattle General Strike. Interestingly, Anna Louise neglected to name herself, or Anise, as the author for this headlining editorial. Her audience was sure to know that it was the work of Anise, however, merely by the literary style—the capitalized words and consistent use of hyphening—that was characteristic of her daily ragged verse poetry. Despite intending the editorial for the male-centered unions, Anna Louises mention of caring for the babies and the sick demonstrates a certain ambiguity in her convictions. Anna Louise could not evade the issues of the domestic realm. Anna Louise's editorial led to serious ramifications for the fate of the General Strike. Tracy B. Strong asserts that the editorial contributed to encouraging Seattle workers to focus more on, and explore to a greater extent, issues concerning the undefined goals of the strike. While the article may have inspired workers to construct aims in addition to encouraging Seattleites to support the efforts of the strikers, Anna Louise inadvertently exacerbated the fear of radical revolution amongst the middle class. Furthermore, the article contributed to the already-existent sensationalism in the media. Rival newspapers, such as the Seattle Post-Intelligencer, and labor-sympathetic papers such as the Seattle Star, responded vociferously with exaggerated accounts of an impending Seattle Revolution, Bolshevik style. Anna Louise's controversial editorials would eventually lead to her arrest in April, along with the rest of the staff of the Union Record for their involvement in promoting the General Strike. Accused of plotting to incite resistance against the United States government, the charges were eventually dismissed, but not before branding Anna Louise a dangerously revolutionary Communist. Records from the Minute Men, a powerful, semi-official group of spies designed to infiltrate and suppress sedition, reported on an editorial Anna Louise wrote in which she promotes certain classes being offered at the University of Washington during the summer session following the General Strike. The report accuses Anise of scheming to flood certain classes...with a wobbly [ I.W.W.] element to such a large extent that the radicals take complete possession of the course and the teacher, and thereby rendering the opinions of the teacher and other students useless... Thus, Anna Louise's editorials would continue to be perceived as a threat to the status quo well after the strike ended. While her feature editorials and Anise poems exemplified her radical politics, especially regarding the government and labor issues, Anna Louise demonstrated yet another dimension of her journalistic style and staunch opinions through the Ruth Ridgway column. Appearing on the women's page of the Seattle Union Record, letters to the advice columnist Ruth Ridgway provided a forum for the discussion of women's issues. Moreover, it served as a forum for Anna Louise herself to give her views on the role of women in the labor movement and the process of social change. Identifying Ruth Ridgway as Anna Louise Strong has been a rather elusive endeavor. While Anna Louise claims that she wrote almost a complete page of the Union Record nearly everyday, she makes no mention in her autobiography of contributing to the advice column. Moreover, Anna Louise does not offer much as to her feelings about the role of women within the labor movement in I Change Worlds. A few sources describe Ruth Ridgway as representing several different women working at the Union Record. It appears that following Anna Louise's resignation from the Union Record, the Ruth Ridgway column was taken over by either Mary L. Chamberlain, a former staff writer for Survey magazine, or Mary Ahlgren, a former federal wartime social worker. The evidence connecting Anna Louise with the advice columnist, however, is quite compelling. First, the Ruth Ridgway column began in April of 1918, around the same time that Anna Louise was hired onto the Union Record staff. Second, the column stopped for a period of months that correspond with a vacation taken by Anna Louise. Furthermore, Ruth was the name of both Anna Louise's mother and her best friend, a woman who helped with her introduction to Socialism. The name Ruth Ridgway was an appropriate choice for a pen-name for the column since Anna Louise's own mother was named Ruth. An active advocate for many women's organizations and clubs in her life, Ruth Strongs influence in Anna Louise's journalistic career can be clearly seen in this Union Record column. The Magazine page of the Record was solely devoted to women's issues, the news articles mainly dedicated to fashion, beauty, children, cooking—issues associated with fulfilling the role of a good wife. The Ruth Ridgway column provided a certain contrast to these domestic topics; the advice column was politically charged and served as a platform for debate about the actual role women should play within the labor movement and society itself. If she marries, what has she time to learn about housekeeping? What does she know about the sacred duties of being a mother? What can you expect her to know? You don't expect men to hold down all day jobs and learn at the same time how to run a home and bring up babies. And how can you expect girls to do it, when they are not as strong as men? Isn't it reasonable for her to want to keep on in the work she can do even if it pays her a little? The men are saying: If women will keep out of industry we can make enough to support then in the home. But have they done it? If women are in industry its the men's fault. The men should organize and take control of industry, and then they would have enough to keep the women in the home. At times, the advice column would not print any letters, instead serving more as an editorial column for Ruth Ridgway. In one issue from 1918, Ruth Ridgway asks her readers How is the war affecting your children? She then proceeds to discuss several tales of how children interpret the war. These stories, Ruth Ridgway argues, were vouched for by a friend of mine. The advice columnist argues for equal pay for women , and for the socialization of housework that would allow women to become equal wage-earners. Unfortunately, the women's page of the Seattle Union Record promoted the stereotypical image of the middle-class woman residing in the sphere of domesticity. By focusing on fashion and appearance, the articles acted, in essence, as an advertisement for women of middle-income families, never mind that the Union Record was a newspaper created for the working class. The women's page typically included a Daily Recipe, a daily Fashion Tip, and a column called My Husband and I, written by Jane Phelps. Articles such as these were not inherently useful to the average wage-earning woman, who was single and usually lived at home or in a boarding house. This is not to say that married wives and mothers did not participate in labor, but their number as a wage-earning group was significantly smaller. Although the Ruth Ridgway column did tend to seize more substantial topics with more serious consequences for women, the column still encouraged the sexual division of labor. Women were encouraged to aid in the labor movement by being good activist housewives and raising class conscious children. The ambiguous nature of the magazine page illustrates the struggle for many women to define the role of gender within the efforts of the labor movement. To a certain extent, Anna Louise embodied the problematic role of the Socialist woman in early twentieth-century America. In general, Socialists combined the interests of the women's struggle for equality and the plight of the workers—they failed to view women as having distinct conditions to deal with. While they fully acknowledged the fact that women were forced into low-paying, often temporary employment and were generally responsible for housework and childcare, Socialist ideology did not consider any kind of domestic role as contributing to real production. The protagonist of history, in the minds of Socialists, was the proletariat. While Anna Louise's writing appears to reflect this Socialist ideology, themes of domestic life and children abound in her columns, suggesting an ambivalence about the role of women in the labor movement. Anna Louise Strong was an enigmatic, influential, and unique character in the Seattle labor arena. She came to the Pacific Northwest as an unknown journalist with a vision of social revolution without arms; she left Seattle a notorious writer whose words had penetrated the ranks of a white-male dominated labor movement. Though many Seattleites—politicians, the aristocracy, and even much of the middle class—disagreed with her political philosophy, no one can dispute the brilliance she demonstrated in her journalistic abilities. The variation of written material that she produced so quickly for the Seattle Union Record is testimony to her dedication as a writer: Anna Louise wrote about nature, labor, race, gender, and the personal lives of strangers and friends—all within the framework of a quest for a social transformation leading toward peace. Though she happily made her life in Russia, and eventually in China, after her years in Seattle, Anna Louise always felt a certain obligation to her homeland. For there is another land who workers have the right to claim that I deserted the struggle which I with them began. In times and ways and to an extent yet undecided, I recognize their right to call me back. My life must henceforth as I have made it, a link between two lands. Anna Louise romanticized that a social revolution that would bring equality of all classes would naturally translate into the equality of all people regardless of race or gender. She by no means equated the white-male dominated labor movement in Seattle, and in other cities across the country, with the promulgation of gender and race discrimination in unions. Anna Louise was bothered by the question of women's status and did not enjoy being ordered into a designated role. Ironically, however, the structure of the Union Record contributed to the perpetuation of this practice. Furthermore, Anna Louise herself fulfilled the typical single, middle-class woman's role both at home and professionally through her work in the children's welfare movement and the school board. The writings of Anna Louise Strong show the complexity and paradoxical nature of her role in the labor movement. In one sense, Anna Louise's writing demonstrated her feeling that women were oppressed because they were workers, not because of their gender. However, neither Anna Louise, nor Anise, nor, especially Ruth Ridgway, could escape the traditional tendencies embedded in her family life or her middle-class roots. Anna Louise would eventually leave the domestic sphere of her family in Seattle and become a pioneer in another nation before she would truly seize her independence. OConnell, Mary Joan. "The Seattle Union Record, 1918-1928; a Pioneer Labor Daily". (MA—University of Washington), 1964. Ogle, Stephanie. "Anna Louise Strong, Progressive and Propagandist. "(PhD—University of Washington), 1981. Ogle, Stephanie. "Anna Louise Strong, the Seattle Years." (MA—Seattle University), 1972. Strong, Tracy B. and Keyssar, Helene. Right in Her Soul. New York:Random House, 1983. Anna Louise's editorials and ragged verse poetry written for the Seattle Union Record -Anna Louise started her days at the Seattle Union Record writing under the name Gale; later she would sign her editorials by her real name or omit signing her name at all; her daily poetry column was usually attributed to Anise. Anna Louise's autobiography I Change Worlds: the Remaking of an American—the sixth and seventh chapters, titles Signals from Moscow and Our Seattle Revolution, respectively, are primarily concerned with the events and circumstances leading up to Seattle General Strike, her involvement as a journalist, and, finally, the aftermath and its consequences. (A copy is available in the Special Collections Library at the University of Washington). The Anna Louise Strong Papers at the University of Washingtons Manuscripts and Archives—the archives contain an a very comprehensive collection of Anna Louise's in-coming and out-going personal and professional letters, scrapbooks of articles in both their draft and published form, pamphlets, and an extensive compilation of her poetry.